Finally, a great noodle place in downtown! If you ever struggle, like I always do, to find a place to eat while shopping in Union Square. This is the place to go. I’ve heard about the wait. I’ve seen the wait. That’s why I’ve held off eating here for so long. K and I ended up waiting for about 10 minutes. The restaurant is small. It can’t possibly sit any more than 25 people. The wait staff is friendly and service is quick. This is a great option for a bite before a show at the Curran Theater just across the street. Just make sure you come early to put your name on the wait list. They have 3 options for broth – miso, soy and salt. I’ve always been a fan of rich and creamy miso broth and I’m a fan of fried chicken so, K and I both ordered the fried chicken ramen in miso broth. I asked for the “light” miso which I am sure is not very light. 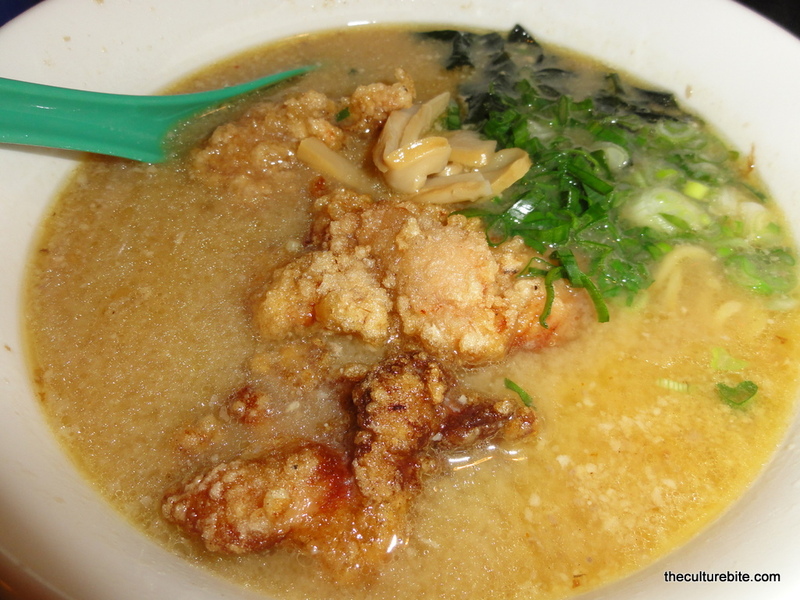 Fried Chicken Ramen w/ Miso broth – The broth was thick, rich and not too salty. The toppings added are seaweed, pickled bamboo shoots and green onions. There is a TON of fresh ramen noodles in each serving. Usually, I could eat a whole bowl, but not this one. I had to give my leftovers to an eager K across the table. The fried chicken was super moist and fatty. Nothing low-fat about this dish at all. Spicy Roll – While eating our ramen, an ad for their spicy roll was staring at us over our table. We had to try it. The Spicy Roll is made of fresh tuna and an insanely spicy chili paste. This was actually pretty painful to eat as it lived up to its name. Never again. I’d love to come back to Katana-ya and try a different kind of ramen. The butter corn caught my attention last time. Yum!